During a match in the 1926 Army tour, Dhyan Chand's stick broke and the maestro threw it away. His fans had made a dash for it, and many people took away broken splinters. Nearly half a century later, when Dhyan Chand's son Ashok Kumar visited New Zealand, a man came up to him and showed some wooden splinters that he had kept from Dhyan Chand's hockey stick. n 1926, there was talk of the Indian army sending a hockey team to tour New Zealand. It was not in Dhyan Chand's nature to plead for his inclusion in the team. He felt his merit as a player would decide his selection. Being in the 'Other Ranks', he could not approach his officers to discuss the matter. Thus he was overjoyed when the commanding officer of his regiment told him one day, "Boy, you are going to New Zealand." Though dumbfounded, Dhyan Chand managed to salute the officer. Later, overwhelmed at this opportunity, he broke down in his barracks. Tears of joy also came to the eyes of Bhole Tiwari when he learnt that Dhyan Chand's perseverance had finally paid off. Due to lack of money, Dhyan Chand could not obtain good clothes for the tour. His main personal outfit was his military kit. In April 1926, the Indian army hockey team set off by ship from Colombo. After 20 - 25 days on water, the team reached New Zealand in early May. This was the first team to represent India abroad in any sport. Thus the players were conscious of the fact that they had to project a good image. Dhyan Chand was hugely successful on this tour. In one match at Dannkerke, India scored 20 goals out of which Dhyan Chand was responsible for 10 goals. Against the New Zealand national team, India won the first match 5-2, but lost the next 3-4. Overall, India played 21 matches, won 18, drew 2, and lost 1. The Indians scored 192 goals while conceding only 24 goals. Dhyan Chand scored over 100 goals and became a popular player. Indeed, such was his impact that two women followed the Indian team from New Plymouth to Auckland only to see Dhyan Chand in action. The told him that they could never forget his dribbling. The Indian team was feted and honoured with feasts and lavish dinners. The treatment that Dhyan Chand and the rest of his army mates got was that of heroes. News of Dhyan Chand's exploits reached India as the local newspapers carried reports of the Indian team's progress. 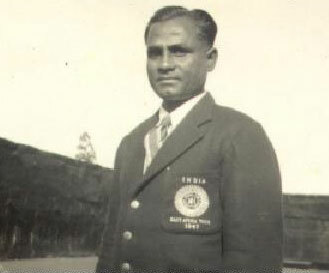 Dhyan Chand got promoted to Lance Nayak on his return to India. The success in New Zealand gave Dhyan Chand tremendous inspiration, and he felt there should be no slackness on his part. This 1926 Army tour started India's hockey story, and with it, Dhyan Chand's legendary prowess. Nearly half a century later, when Dhyan Chand's son Ashok Kumar visited New Zealand, he was surprised to see pictures in many hockey clubs of his father's 1926 Army tour. On one occasion, a Dhyan Chand fan showed Ashok the cuttings on the hockey wizard that he had collected and kept safely all these years. Ashok had another touching experience. A man came up to him and showed some wooden splinters that he had kept from Dhyan Chand's hockey stick. During a match in the 1926 army tour, Dhyan Chand's stick had broken and the maestro threw it away. The fans had made a dash for it, and many people took away broken splinters.